Purchased a few months ago. After seeing numerous 650B 'Gravel Grinders' with eye watering price tags appearing here, there, and everywhere, I used these stis to convert a 26 inch wheeled 93 Stumpjumper hardtail into a more useable bike again. After a clean and some patient set up, they work flawlessly with the original Deore LX front and rear derailleurs. 3 x 7 shifters. shimano tourney. Work well. No problems so far. ConsIndicators go the wrong way! ProsWork well, easy to fit, look OK. I bought these to replace the 90s Shimano STI brake-shifters on my 90s custom Dawes Galaxy tourer with Randonneur bars. When I bought the bike, this type of shifter was cutting edge and only found on racing bikes, so the ones I had fitted cost the equivalent of about £200 and were only 14-speed and I couldn't use one of the chainwheels, but I loved them. When I came to replace them I found I could only get this model that would fit my 21-speed system. They are much more cheaply made (eg plastic body instead of metal) and have thumb levers instead of the under-levers on my old ones and current upmarket models, but they were only £60 and there was no other choice without replacing the changers and sprockets, so I went ahead. Despite my reservations I've been very pleased with them so far, and if anything I prefer the thumb levers. The gear indicators aren't much help, especially as they go the wrong way. The hoods are comfortable. Can the triple shifter be set up to operate with a double chainring? Are these shifters compatable with shimano acera back and Alivio front derails? I'm switching the handle bars on y Marin San Rafeal to drops and need a pair of 3 and 7 shifters - could these be the ones? These would certainly work for you. The levers can be used only with cantilever brakes or they are compatible with other brake types? These are designed for road style brake calipers, road disc brakes or center pull cantilevers. As long as the system is 3x7 these will work fine. Thinking of fitting to a tandem, which has front & rear cantelever brakes & a drum brake, so 3 brake cables in total. You could fit a cable splitter to convert one cable into 2. Are downtube cable stops included? If yes, are they steel or alu frame compatible (rounded or flat)? Thank you. Unfortunately these levers do not come with down tube cable stops so you will need to order a set separately that suit your frame. 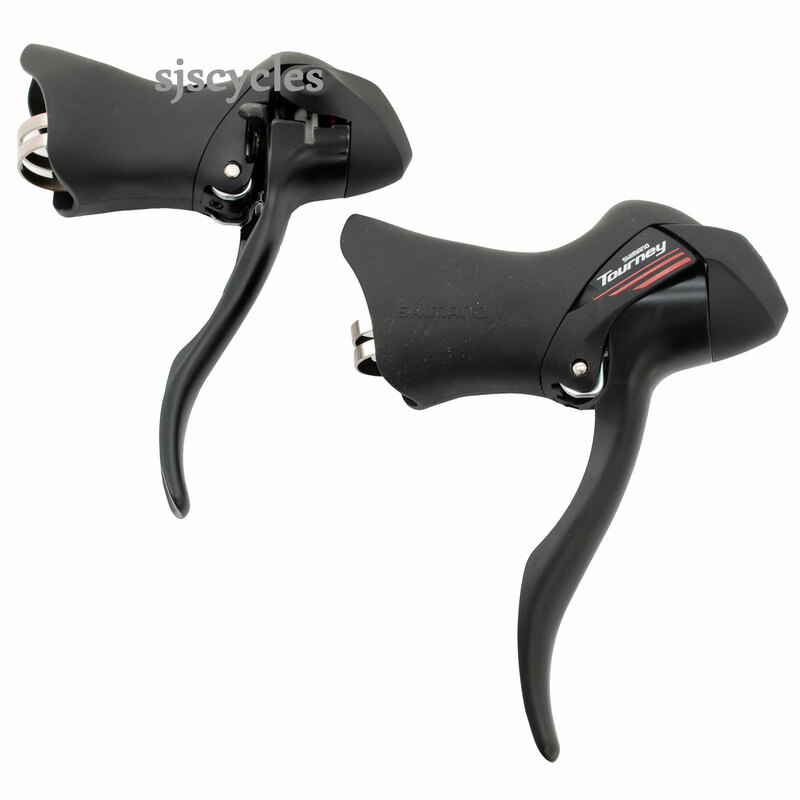 Are there cable and cable Housing included in the product Shimano Tourney ST-A073 7 Speed Triple Road STI Levers? Yes there is cable and cable housing included. Are These Compatible With Mid 90S Front And Rear Shimano Fd-Mc32 & Rd-Mc32 Derailleurs? If not compatible with my current set up could you recommend suitable derailleurs for a mid 90s cro-mo tubular frame. Thanks. These levers would be compatible with your rear derailleur but the cable pull would not match for the front. You would need to fine a suitable 7spd road front derailleur instead. These unfortunately would not be compatible with a Nexus 7spd. Shimano derailleur gears and hub gears use different cable pull ratios so are not interchangeable. You will need to go for a Nexus 7spd specific shifter. Can You Ship To Denmark? How Much Is The Shipping Cost? Need shipping cost to Demark. Please also confirm tranait time. We can ship worldwide, for a shipping quote just add all of the items you are looking at to your basket and the website should calculate the cost for you. Thanks for your previous reply. I believe they are called "noodles" and you appear to have them available in connection with V brakes. Are these the ones you mean or are there different ones for gear cables? I'm sorry for my small typo in previous reply, I did mean noodles. We use the V-brake ones but we sometimes have to grind down around 5mm of material when used with STI's otherwise they don't sit flush to the lever. Do The Cables Allow Space For A Bar Bag? I would like to fit these to my touring bike but I have a bag on the handle bar. Will there be space for a bar bag between the cables? It looks like the gear cables exit the levers horizontally and route just where the bag would be. The cables do leave horizontally from these shifters, it depends completely on your set up to whether or not the will interfere with the barbag. It is quite likely it will but not guaranteed. There a few solutions to get around this, you could mount your barbag onto a T-bar to move it out of the way, or alternatively you could fit metal cable "noddles" to turn the cables 90 degrees safely just after they come out of the shifters. Do you know whether these levers will be compatible as a replacement for a set old 7s shimano RSX levers ? (Triple chainset and 7 speed cassette). The cable pull used on Shimano 7spd shifters has not changed so these levers should work perfectly fine. How do the brake and gear cables exit the lever assembly? Are they concealed beneath the bar tape, emerging close to the stem or otherwise? The brake cables, run under the bar tape where as the gear cable exit the shifters straight away inwards at 90 degrees to the brake cable.